While diabetes can usually be well-controlled using modern therapies, metabolic emergencies inevitably occur. 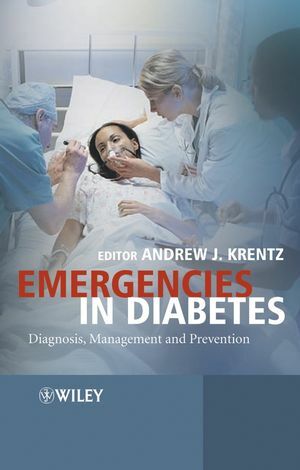 This book provides an easy-to-read yet comprehensive account of emergencies in diabetes conveniently collected into one volume. For each topic, a brief review of the pathophysiology is followed by a description of cardinal clinical features, clinical and biochemical assessment and clinical management. Designed to fit conveniently into the pocket of a white coat, this book should be readily to hand in all hospital medical wards, particularly A&E. It will be useful to junior hospital doctors across a wide range of specialties, senior house officers in general medical training, and nurses involved in the care of patients with diabetes. Andrew J. Krentz, Lead Consultant in Diabetes and Endocrinology Southampton University Hospitals NHS Trust Southampton UK. 1. Diabetic Ketoacidosis in Adults. 2. Diabetic Ketoacidosis in Childhood. 5. Hypoglycaemia Caused by Insulin Secretagogues. 6. Lactic Acidosis in Diabetes. 7. Management of Diabetes During Surgery, Myocardial Infarction and Labour.